From Russia with love in heart and matryoshka dolls in a bag, that’s a typical result of visiting St. Petersburg for most guests. And traditional magnets to stick to refrigerators are also on the list. Well, really not bad and in most cases that’s enough. We will tell you about the best places to buy «traditional» souvenirs in here. 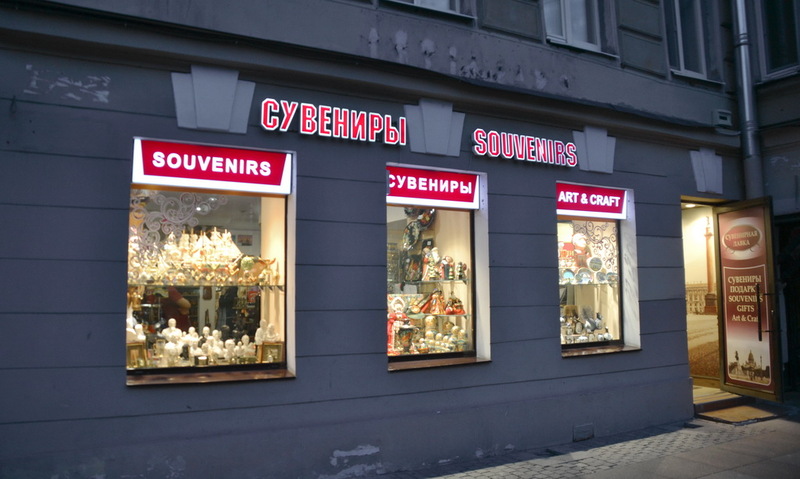 Saint Petersburg center is filled with souvenir shops, in Russian signs read as «Сувениры» or «Подарки», though you will have no problems in finding English signs. An ordinary «lineup» includes, besides matryoshkas and magnets, T-shirts, playing cards, cups, plates, spoons, forks, postcards, caskets, bracelets, shot glasses, widgets, clocks, umbrellas, hats and many kinds of other stuff. Nothing unusual, maybe except military-styled caps and combat vehicle crewman helmets. What’s interesting, many things are being associated in minds of Europeans and Americans for a long time and strongly with Russia, but the Russians themselves rarely keep these items at home. For example, a matryoshka is rather hard to find, though, of course, possible. 1. 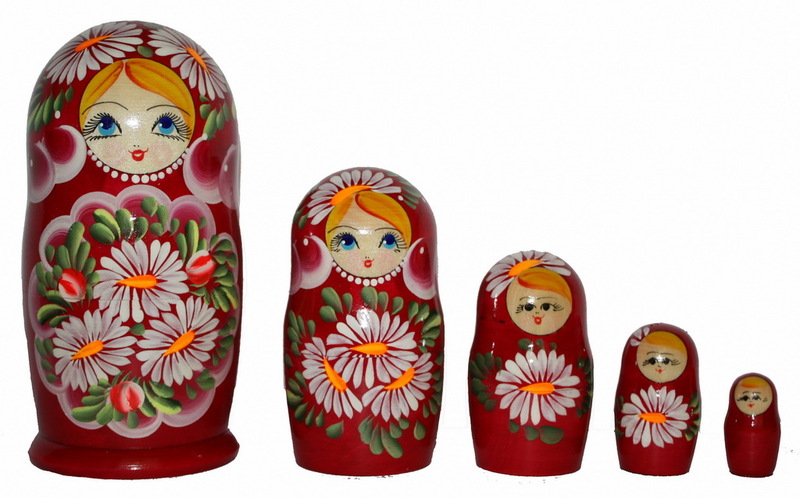 … a matryoshka doll («babushka»), or to be more specific, a few matryoshkas, since the main feature of the doll is that she contains another one, a bit smaller. And this one contains another one which in its turn one another etc. till 8 dolls of different sizes. 2. 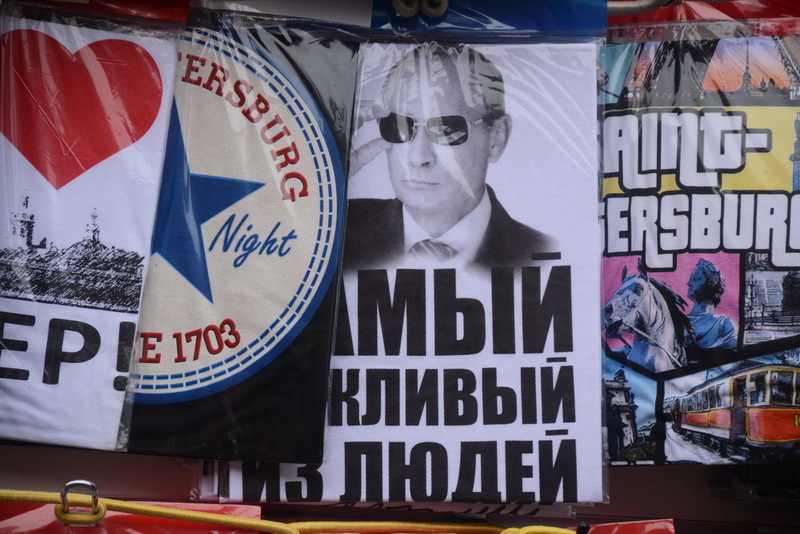 T-shirts with President of Russia Mr Vladimir Putin are now becoming increasingly popular. Yes, we know that Mr Putin is always number one (sorry, Mr Obama), but even he couldn’t beat a family of matryoshkas. 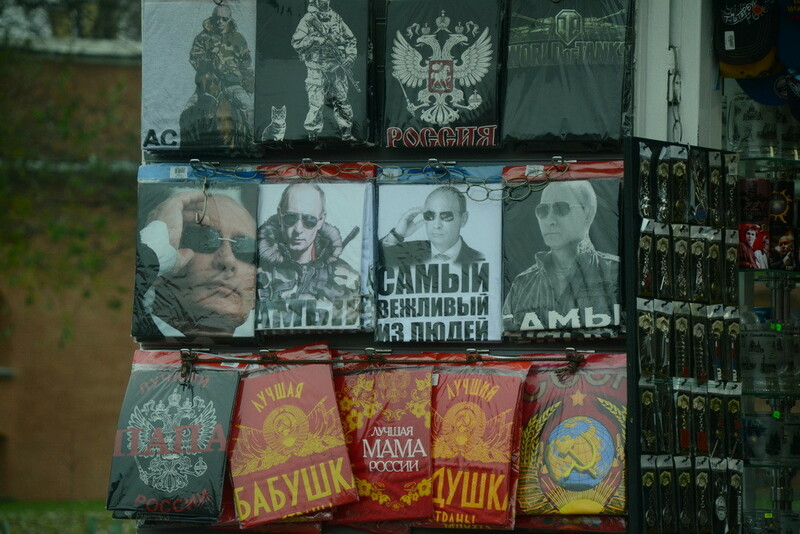 The T-shirts refer to the macho image of Putin created in the early period of his rule and being maintained till so far. The image has been seriously amplified by the siege of the Crimea peninsula and the words «polite people» which Putin applied to the troops conducting the annexation of the peninsula in 2014. 3. Playing cards with sights of St. Petersburg, exhibits of the Hermitage, the Russian museum, etc. Ideal option when you need distribute many gifts among members of your huge family and colleagues. Playing cards are rather cheap, St. Petersburg-themed, and do not occupy half a luggage bag. 4. Faberge’s eggs may sound a bit strange as the French name Faberge causes more associations with Paris than with St. Petersburg. However, before the Socialist Revolution in 1917 the city was flooded with world-famous architects, artists, jewellers, writers of non-Russian origin. Peter Carl Faberge (https://en.wikipedia.org/wiki/Fabergé_egg) served to Russian Emperor’s family and created about 50 imperial Easter eggs before leaving the country after the Revolution. There are also Faberge-styled products, first of all, jewelries, without direct connection to the Faberge House’s production and activity. 5. Pavlov Posad shawls of different types and colors as well as other items of assortment. At Amazon they are being sold for $80-100, in St. Petersburg you can find for much cheaper. The factory of Pavlov Posad is located near Moscow, not St. Petersburg, but its products (about 800 kinds of shawls, kerchiefs, staves, etc.) are nationally and even globally popular. One of the reasons for this to be in-demand is that it’s easy in packaging and transportation. Another note is that a shawl or a stave are very practical things, not just one more nice knickknack to be left and forgotten on a shelf. 6. 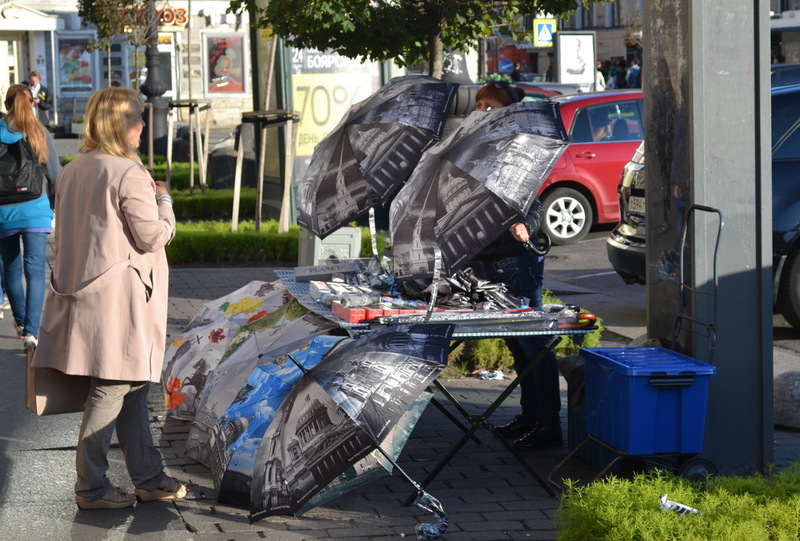 Umbrellas featuring landscapes and sightseeings of St. Petersburg. These beautifully looking things can be both souvenirs and of practical use. We’d recommend you to buy them just upon arrival and them take with you back home to hand over to someone who will need them. That will be a present with the spirit of the city. Here is a list of souvenir shops located in the very city center where you are likely to spend lion’s part of your time during your stay in St. Petersburg. Important note: we give you addresses closest to the Nevsky avenue and major sightseeings, which are, of course, sell at higher (though not much) prices. If you need some addresses outside of the downtown or have any special request, contact us. 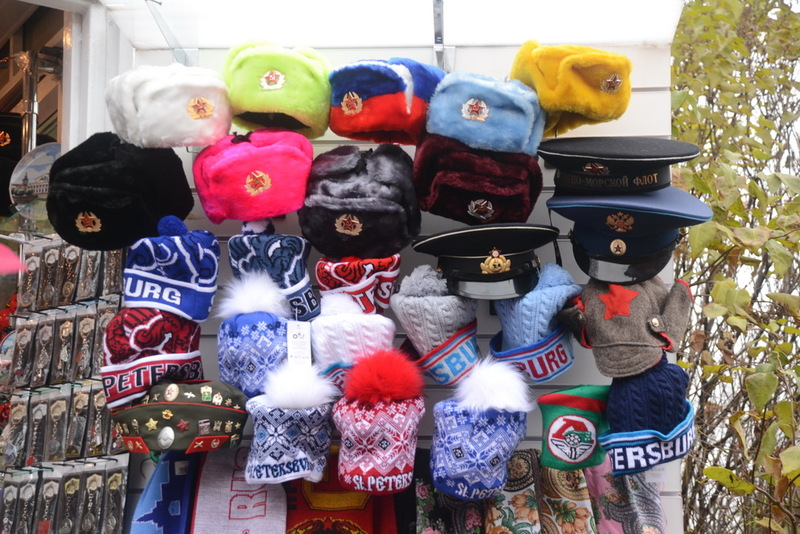 Souvenirs sales points are located near every major sightseeing, at the Peter and Paul fortress, hotels, railway stations, Pulkovo airport, in the subway and underground passages as well as trade centers. 1. Onegin (art gallery). 11, Italyanskaya (Italian) street. The shop is located just near the Mikhailovsky theater and Hotel Europe. 2. Gang. 13, Bolshaya Moskovskaya (Big Moscow) street. It’s ethnic shop, focused, first of all, on the Indian theme. 3. Amber. 19, Malaya Morskaya (Small Sea) street. 4. Art Space. 1, Nevsky avenue. It’s the place where the Nevsky avenue nearly meets the Palace square and the Hermitage. 8. Souvenirs. 35, Nevsky avenue, Bolshoy Gostiny dvor trade center. 10. Souvenirs and Gifts. 85, Nevsky avenue. The shop is at the Moskovsky railway station. 11. Heritage (gallery). 37, river Moika embankment. 15. Russian jeweller. 4, Mikhailovskaya street. If you have any questions about St. Petersburg ask us in the comments.